It’s not every day I step into a tourists zone and get chased down by a flying dragon. On this hot October, Pyra and Company descended upon Downtown Disney’s west area to visit Asia Trend Magazine’s annual tour through Asia without the hassles of taking horrible passport photos. The Asian Cultural Expo was already in full swing by the time we entered at 11am. A Chinese dragon held up on sticks by dancers weaved around the grounds—and nearly mowed me over in their dance. Something tells me it’s lucky to get run over by a dragon so I guess next time I won’t squeal and run. On the nearby lake, the Dragon Boats had already begun their competition. Long, needle-like boats covered in bright colors were flying over the water. The boats only motor were the synchronized rowing of its passengers to a drummer’s beat. Throughout the Expo’s grounds and in Downtown Disney itself, many of the rowing teams could be seen flitting around in their colorful, tight spandex uniforms from store to store. Something tells me it’s not as lucky to get run over by a dragon boat team. The Expo’s main feature took place on the short, unassuming stage (could we raise that platform or add a backdrop for next year?). A handful of Asian countries delivered cultural performances for the eager crowd. Besides the traditional tinikling, the young Filipino performers added some hip-hop flavor to the second half of their dance through bamboo poles. Polynesian dancers waved their hips to a pulsing beat. Even Peking Opera was present in the form of two ladies fresh from performing the same act in front of President Obama. Sprinkled among the performances were martial arts demonstrations. The finale (always a crowd pleaser) were the Taiko drummers. Multiple workshops allowed the crowd to get their hands on learning a bit of the traditional dance moves. 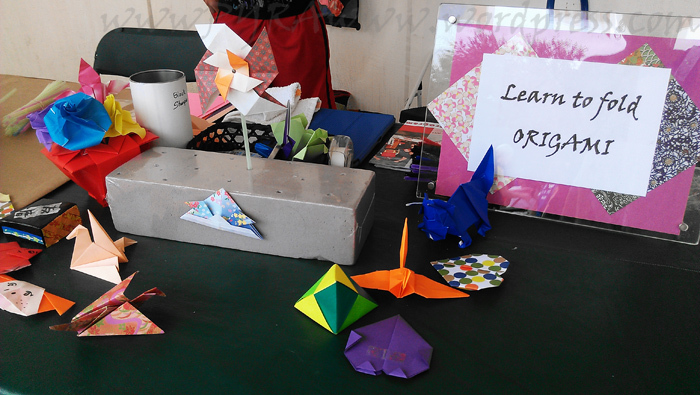 On the Expo’s grounds, other activities included areas to learn a bit of origami or get your name/phrase written in Chinese calligraphy. Although every possible space was conquered by a booth, I would’ve preferred more booths showing off Asian activities rather than sponsors (although for a free exhibition like this I guess having sponsors around are necessary). Hey! I can write names/phrases in the old Philippine writing—I want a booth! Or in true Disney fashion, can’t we have more tents selling cutesy Asian goodies? Glaringly obvious was the lack of Asian food. I expected there to be no food at this festival because of the probable competition against the Downtown Disney restaurants… but two non-Asian food trucks parked at the Expo’s side always had a line. Sweating from the outdoors and with the beat of the Taiko drums fading away, my crew still had the rest of Downtown Disney to explore. Visiting so many Asian countries made us hungry. Previous Post CIRQUE’S ZARKANA– MAGICAL? Next Post CEMETERY AND ORPHANAGE SCARES—IN A NEIGHBORHOOD!